Braden Bumey, Midlothian. Not shown is Morgan Cooper, Waxahachie. ​Mike Dillow, Club VP of High School Relations. To establish and maintain scholarships for needy and worthy students attending Texas A&M University. One of the major events of the year is holding the traditional Aggie Muster. Muster is held annually on April 21st to commemorate and remember former Aggies who have completed their life on earth during the preceding year. View scholarship guidance and application on the Scholarships tab, above. 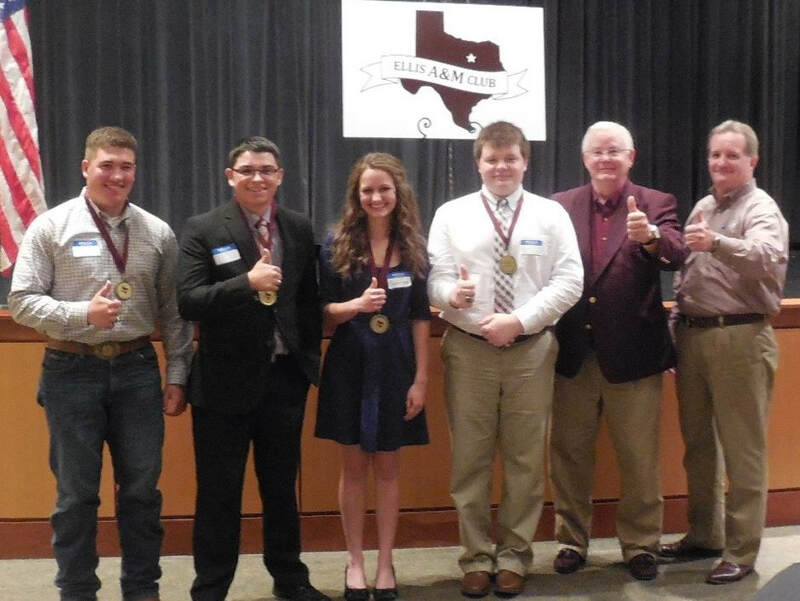 The Ellis A&M Club was chartered in 2004 by many local Aggies whose desire it was to accomplish the stated purpose. Former Aggies and friends of Texas A&M that reside in the geographical proximity of Avalon, Italy, Maypearl, Midlothian, Milford, Ovilla, Red Oak, and Waxahachie may become members of the Ellis A&M Club with guest privileges available for former Aggies that live beyond these cities. Meetings are held periodically providing insight into various interests that are current in the minds of our members. Notice is made of these meetings by email, so it is incumbent on everyone to keep the Club advised of any changes in email addresses. We have an Archive for historical items. Run your mouse over the HOME tab to access Archives.